end of the season shopping, also known as SALE TIME, is my favorite kind of shopping. maybe this is my inner cheapskate coming out, but there’s really nothing like scoring a piece you’ve had your eye on for months at 60% off. the thrill of the hunt, i guess. men have hunting and gathering, we have shopping. that might be the most superficial statement i’ve ever written. please forgive me. 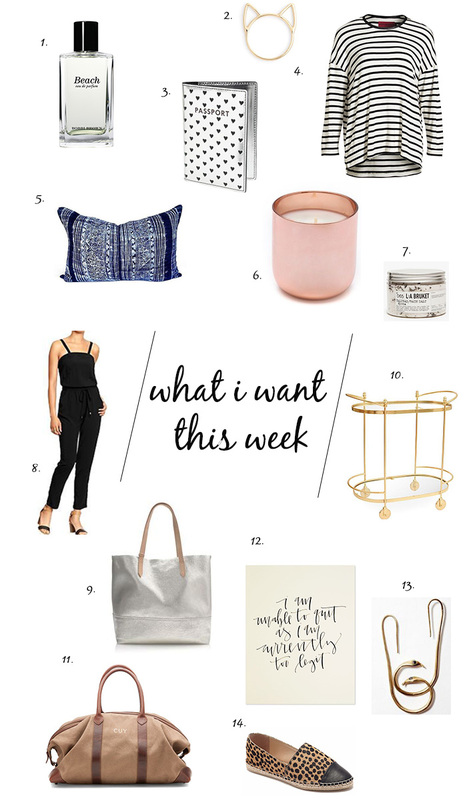 this week’s shopping list is brought to you by three things: pieces i can bring to mexico, pieces i want in my apartment, and pieces to carry all the little pieces of my life (helllooo, tote bags). seriously, though, santa baby, can you shimmy that bar cart down the chimney to me? i’m sure hanukkah harry would be happy to help. i’ll leave you both some cookies, and some gelt for harry. happy shopping, and happy august! holy moly, this summer is FLYING by.